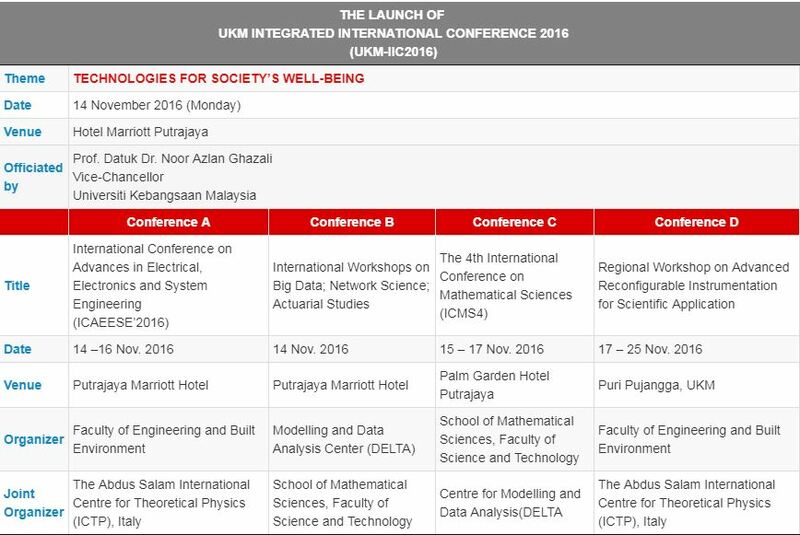 UKM Integrated International Conference 2016 (UKM-IIC2016) is organizing large-scale international conference that aims to collate major international conferences held at the university on broad areas of research. 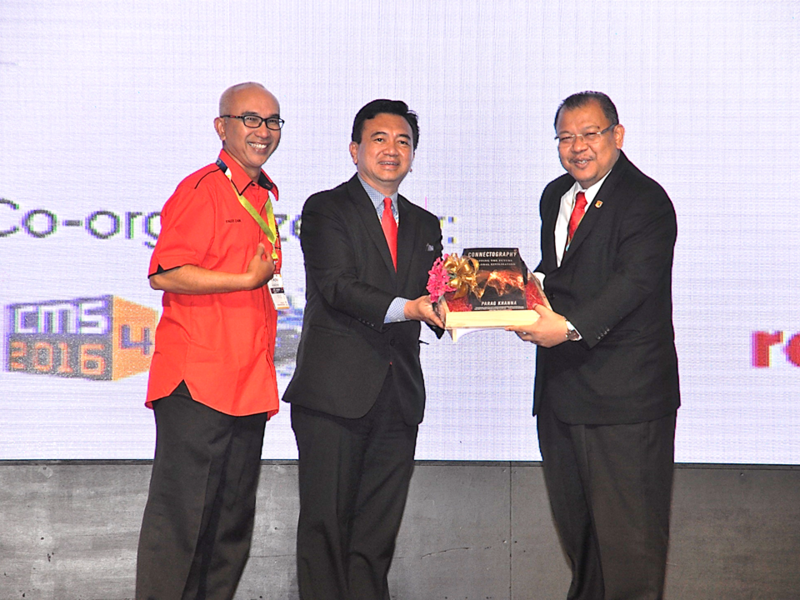 UKM-IIC2016 is set to become one of UKM’s major icons by positioning itself as a platform for sharing knowledge in the various fields of interdisciplinary research available at the university. 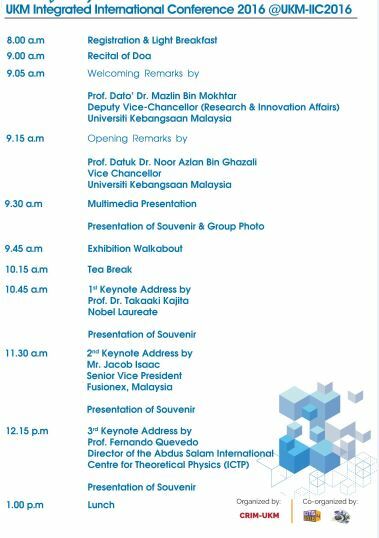 UKM-IIC2016 also provides opportunities for researchers to highlight research ideas and output that it believes has the potential to catalyse a culture of innovation and expand the university’s research network. The International Workshops on Big Data; Network Science and Actuarial Studies are events in conjunction with the 4th International Conference on Mathematical Sciences (ICMS4 2016). It is organized by the Centre for Modelling and Data Analysis (DELTA), a research wing under the School of Mathematical Sciences, Faculty of Science and Technology, Universiti Kebangsaan Malaysia (UKM). The workshops will be held at the Putrajaya Marriott Hotel, Putrajaya, Malaysia on the 14th November 2016. The aim is to improve the quality of education and research in mathematical sciences in general, and in the areas related to data science and big data, network science and actuarial studies in particular. These international workshop are hoped to bring together the professionals, scholars, researchers, scientists and practitioners from around the world to promote cooperation and sharing of knowledge related to mathematical sciences. It is also providing a platform for the participants to exchange ideas and opinions for the development of knowledge in mathematical sciences and the related disciplines. The mathematical sciences is a subject of key global importance, underpinning developments in most areas of science and technology. The growing concern on the transfer of mathematical sciences knowledge demands the enhancement in the competency of this discipline. Applying mathematical sciences to challenging problems of the real world has made the field bustling with excitement and satisfaction. Thus, it is with great pleasure for the School of Mathematical Sciences, Faculty of Science and Technology, Universiti Kebangsaan Malaysia (UKM), to present the 4th International Conference on Mathematical Sciences, ICMS4 2016, to further bridge as well as nurture the understanding and collaboration amongst the regional and global mathematical scientists and practitioners. We welcome academicians, researchers, professionals, students and interested parties to submit qualified and state-of-the-art research papers in all aspects of mathematical sciences from basic science to practical applications. With the theme “Mathematical Sciences: Championing the Way in a Problem Based and Data Driven Society”, the scopes of the conference include but are not limited to: Pure mathematics, Applied Mathematics, Statistics, Operational Research, Actuarial Science, Quality & Productivity, Data Science and Mathematics Education. The ICMS4 proceedings will be published by the American Institute of Physics (AIP) in the AIP Conference Proceedings series which is currently indexed in The Conference Proceedings Citation Index (part of Web of Science), Scopus (Elsevier) and Inspec. The ICMS4 2016 is the fourth edition of the ICMS conference series that have been organized by the School of Mathematical Sciences, UKM. 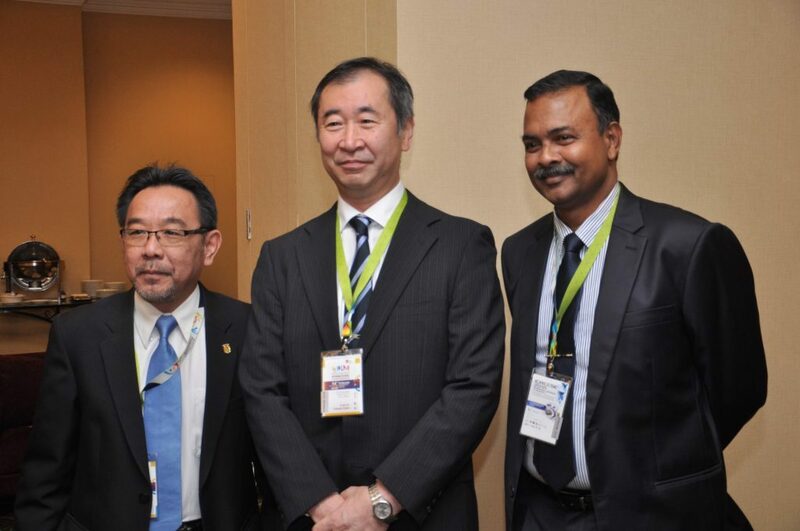 Like the previous editions, ICMS4 is co-organized with the Malaysian Mathematical Sciences Society (PERSAMA). 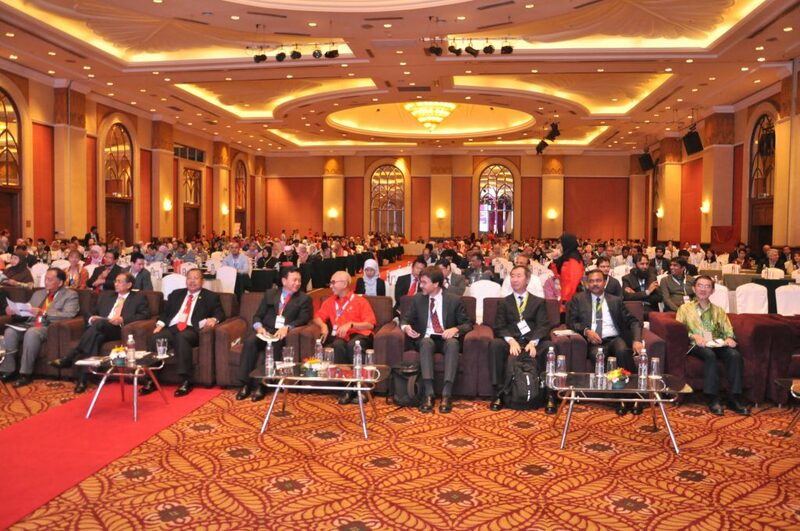 The conference will be held in November 15-17, 2016 at the Palm Garden Hotel, IOI Resort City, Putrajaya, Malaysia. The regional workshop will be held from 14-22 November 2016 in the Universiti Kebangsaan Malaysia (UKM), Bangi, Selangor, Malaysia, which will be organized by the Abdus Salam International Centre for Theoretical Physics (ICTP), Italy and co-organized by Universiti Kebnagsaan Malaysia. The workshop aims at providing key know-how on one of the most cutting-edge technologies for modern scientific instrumentation. This technology relays on reconfigurable embedded processing based on the combination of general purpose processors with traditional Field Programmable Gate Arrays (FPGA) all-programmable System on Chip (SoC). The Workshop will be a hands-on training activity to introduce physicists, engineers and other scientists from the Asia Pacific region to state-of-the art design methodologies for reconfigurable platforms focusing applications in scientific instrumentation and computing. The Workshop will contain theoretical lectures, tutorials, assisted hands on laboratory sessions and demonstrations on reconfigurable instrumentation based on FPGA. The workshop will be an important session for graduate students, engineers, researchers, and academia to cross the design-technology boundary through interactions with design, technology, and process experts to develop the skills for future R&D activities, enhancing manpower progress in microelectronics for the socio-economic development of Malaysia and as well as of Asia Pacific. 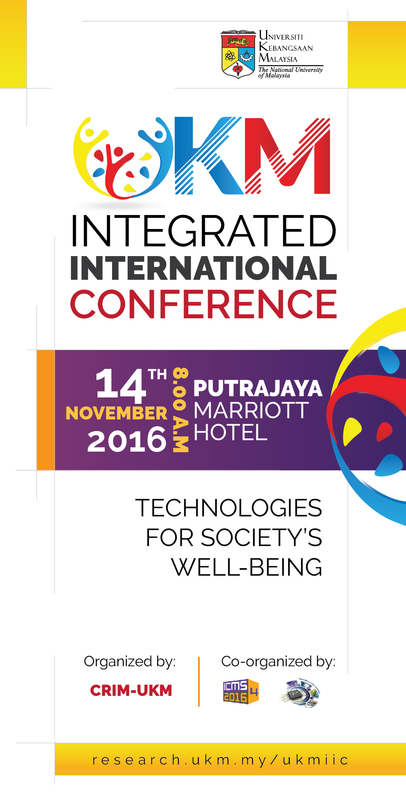 With the theme “Technologies for society’s well-being”, the 2016 International Conference on Advances in Electrical, Electronics and System Engineering (ICAEESE 2016) is an exciting multidisciplinary conference focusing on the technologies and corresponding applications for the betterment of society. The ICAEESE 2016 is the premier conference for exchanging all technical research in Electrical, Electronics and Communications. The conference attendance boasts an outstanding mix of practitioners and researchers from industry and academia. ICAEESE 2016 is an opportunity to share, discuss, and witness research results in all areas of Electrical, Electronics and Communications technologies and their applications for the advancement of society’s well-being. Established on 1970, Universiti Kebanagsaan Malaysia (UKM) is a prominent research university that pioneers innovation in the construction of knowledge to achieve the aspiration of producing a society imbued with dynamic, learned and civic leadership. In UKM, Department of Electrical, Electronic and Systems Engineering is involved in research and education for the technologies for society’s well-being under Faculty of Engineering and Built Environment, which founded in 1984. Founded in 1964 by the late Nobel Laureate Abdus Salam, the Abdus Salam International Centre for Theoretical Physics (ICTP) is an international research institute for physical and mathematical sciences that operates under a tripartite agreement between the Italian Government, United Nations Educational, Scientific and Cultural Organization (UNESCO), and International Atomic Energy Agency (IAEA), which has been a driving force behind global efforts to advance scientific expertise in the developing world. IEEE Young Professionals is an international community of enthusiastic, dynamic, and innovative members and volunteers. Young Professionals chapter, IEEE Malaysia is committed to helping young professionals evaluate their career goals, polish their professional image, and create the building blocks of a lifelong and diverse professional network. 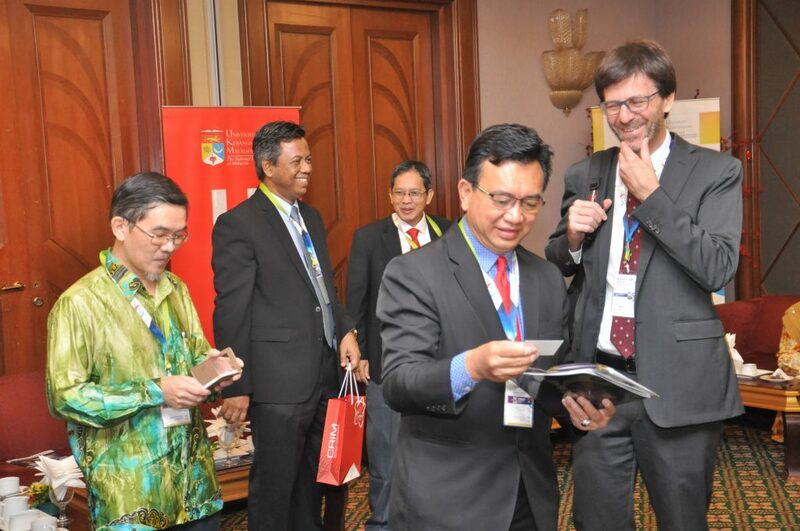 The ICAEESE 2016 is the first biennial flagship conference of the Department of Electrical, Electronic and Systems Engineering, Faculty of Engineering and Built Environment, Universiti Kebangsaan Malaysia (UKM). ICAEESE 2016 will be co-organized with the Abdus Salam International Centre for Theoretical Physics (ICTP), Italy and IEEE Young Professionals, Malaysia section. The conference will be held in November 14-16, 2016 at Putrajaya Marriott Hotel, Putrajaya, Malaysia. Prof. Takaaki Kajita , (born 1959, Higashimatsuyama, Japan), who was awarded the 2015 Nobel Prize in Physics for the discovery of neutrino oscillations, which shows that neutrinos have mass. Kajita received a bachelor’s degree from Saitama University in 1981 and a doctorate from the University of Tokyo (UT) in 1986. Since 1988 he has been at the Institute for Cosmic Radiation Research, the University of Tokyo. He became director of the Center for Cosmic Neutrinos at the Institute for Cosmic Ray Research (ICRR) in 1999. As of 2015, he is the Director of ICRR and a member of Kavli Institute for the Physics and Mathematics of the Universe, the University of Tokyo. Beside Nobel award he is the recipient of several awards such as Bruno Rossi Prize, Panofsky Prize, Asahi Prize, Nishina Memorial Prize, Julius Wess Award and Breakthrough Prize in Fundamental Physics. Abstract: The discovery and studies of neutrino oscillations in Super-Kamiokande will be discussed. In addition, some key technologies used in Super-Kamiokande will also be discussed. As Fusionex’s Senior Vice President in Business Consulting, Jacob has more than a decade’s experience in enterprise software project implementations. He has overseen and been involved in Big Data, Business Intelligence and Analytics as well as Internet of Things (IoT) projects in various industries, encompassing large volumes of data, different data sources to provide in depth analysis of data and trends. Jacob’s technical background coupled with his strong accumulated domain knowledge across manufacturing, market research, financial and asset management has led him to successfully execute and spearhead enterprise projects globally spanning across countries such as the U.S, Singapore, Malaysia, Holland, France, Hong Kong and U.K.
Prof. Fernando Quevedo is the Director of the Abdus Salam International Centre for Theoretical Physics (ICTP), Italy. He obtained early education in Guatemala. His Ph.D. was obtained under the supervision of Nobel Laureate Steven Weinberg. He had research appointments at CERN, Switzerland, McGill University in Canada, Institut de Physique in Neuchatel, Switzerland, and the Los Alamos National Laboratory, USA, as well as a brief term as professor of physics at the UNAM (Mexican National Autonomous University), Mexico. He joined the Department of Applied Mathematics and Theoretical Physics at the University of Cambridge, UK, in 1998, where he is Professor of Theoretical Physics and Fellow of Gonville and Caius College. Quevedo was awarded the 1998 ICTP Prize in recognition of his important contributions to superstring theory. He has Received various honours including Doctorates Honoris Causa from the Universidad del Valle de Guatemala, the Universidad de San Carlos de Guatemala and the Universidad Autónoma de Chiapas, Mexico, the Royal Society Wolfson Merit Award and the John Simon Guggenheim Foundation Fellowship. He is the founder and coordinator of the International Network of Guatemalan Scientists. He is also a Fellow of The World Academy of Sciences (TWAS). Abstract: For more than 50 years, the Abdus Salam International Centre for Theoretical Physics (ICTP) has been a driving force behind global efforts to advance scientific expertise in the developing world. Founded in 1964 by the late Nobel Laureate Abdus Salam, ICTP seeks to accomplish its mandate by providing scientists from developing countries with the continuing education and skills that they need to enjoy long and productive careers. ICTP has been a major force in stemming the scientific brain drain from the developing world.